Large 1.8 litre capacity. Changed your mind?. This does not affect your statutory rights. Helpful Links. Rear water gauge. Fast UK dispatch. Also Known As: Spout Filter. Compatible with the following models. Also Known As: Spout Filter. Manufactured to Original Standards. Compatible with the following models. • Cordless kettle. Colour: Royal Purple. • Illuminated On/Off switch. 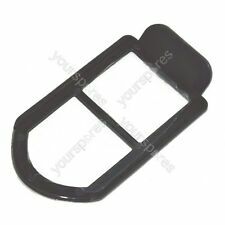 • 360˚ base for right or left handed use with cord storage. • Water gauge. • Cordless kettle. Colour: Royal Purple. Designed for use in Australia 240V. • 2400 Watts. • Removable, washable filter. • Illuminated On/Off switch. 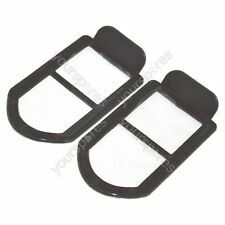 • 360˚ base for right or left handed use with cord storage. Toaster Features. Kettle Features. • Cordless kettle. Colour: Royal Purple. • 2400 Watts. • Removable, washable filter. Toaster Features. Kettle Features. Colour: White with Brushed Stainless Steel Housing. Cord storage for a cord-free kitchen. Defrost, reheat and cancel functions. Split carriage for 2 or 4 slice toasting. Cordless kettle. Colour: Copper. All products are designed for use in Australia 200-240V. Illuminated On/Off switch. 360˚ base for right or left handed use with cord storage. Russell Hobbs Heritage Vogue Kettle Toaster Breakfast Bundle Brand New - Free Shipping Colour: Black The Heritage Vogue collection is the epitome of timeless design. With new textured soft touch features & premium painted finishes, the Heritage Vogue kettle and toaster are perfect additions to a busy kitchen. Kettle Features ---Stainless steel housing & base ---Soft touch grip handles ---1. Cordless kettle. Colour: Red. Illuminated On/Off switch. 360˚ base for right or left handed use with cord storage. Stainless steel housing & base. Illuminated ON/OFF switch. 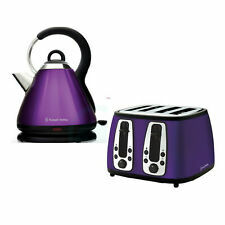 With its contemporary design it will be an impressive addition to your kitchen. Cordless kettle. Colour: Red. Auto cut-off boil-dry technology. Illuminated On/Off switch. 2400 Watts. Removable, washable filter. Pull off lid. Stainless steel housing & base. Illuminated ON/OFF switch. Pull off lid. Stainless steel housing & base. 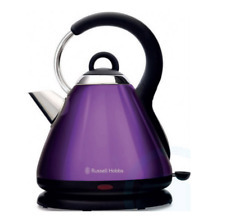 Russell Hobbs Heritage Kettle Condition is New. Dispatched with Royal Mail 2nd Class. Toaster Features. Kettle Features. • Cordless kettle. Colour: Royal Purple. Designed to be used in Australia 220-240V. • Removable, washable filter. Also Known As: Spout Filter. Manufactured to Original Standards. Toaster Features. Kettle Features. Carriage for 2 slice toasting. Pull off lid. Stainless steel housing & base. Colour: Black. Soft touch grip handles. And it’s not just bread that can be popped in for a tasty snack – the toaster has a bagel function too. Therefore products may differ slightly to the image. Opening Hours We are openMon - Fri 07:30 until 16:00. Isle of Wight: PO30-PO41. We promote a 'repair not replace' culture instead of a 'throwaway society'. Unit 5B, Drum Industrial Estate. Isle of Man: IM. All Categories. Channel Islands: GE-JE. Alderney, Herm & Sark: GY9.